In the Science Museum of London is a camera obscura once owned by Joshua Reynolds. The device itself is simple; it is essentially a pinhole camera, and can be produced in any conveniently sized, sufficiently “dark room.” Light passing through a tiny hole or conveniently sized lens is projected, dimly, on the wall opposite, where a strikingly clear but inverted epitome of the world is made to appear. Reynolds’s is a miniaturized model, which through an effort of craftsmanship, has been made to be the size, shape, and outward appearance of a large book when collapsed. Reynolds's self-portrait-- in a repeated pose, gazing through the simplest of optical instruments. National Portrait Gallery, NPG 41. I have been particularly intrigued by Reynolds's camera obscura, which offers itself as a mimetic puzzle in a number of respects. There is, of course, the fact that it looks like any book. It means to pass as an object-- partly so that it could be stored in any gentleman's library, but, certainly partly as a joke on itself, for its purpose is to offer a strikingly realized, miniaturized version of the world. It offers a representation that passes for real. 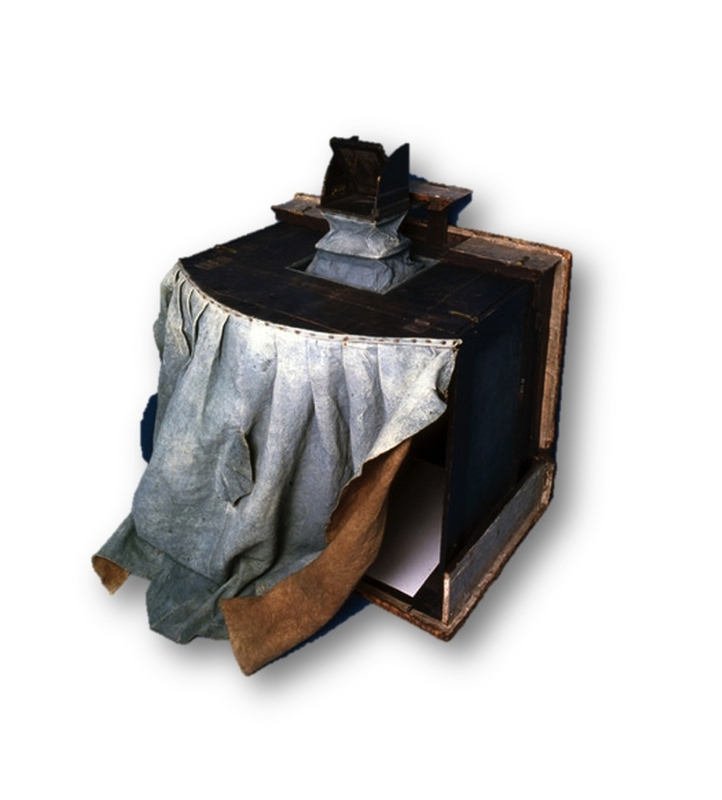 Roughly encyclopedia-sized, the camera obscura is a miniaturization of the world it confronts. Cheselden, Osteographia (1728), Title Page. Image from National Library of Medicine. What Reynolds used it for is unclear. Reynolds was the leading portraitist of his age, and a celebrity in his own right. He was a public person, and his habits were public. He is known by the 1770's to be using it extensively-- along with fellow painter Benjamin West. Belletrist Horace Walpole, who owned a similar model, purchased one of his own as a gadget for entertainment, and he mentions in passing that West and Reynolds had "gone mad" with them. There is certainly evidence that camera obscuras had historically been used for capturing the outlines of things; William Cheselden claims that he used a camera obscura to capture likenesses for his Osteographia (1728), a manual of skeletal anatomy. But whether Reynolds regularly used his to capture outlines, as has been suggested, remains controversial. Camera obscurae had been easily available since roughly the turn of the century. In 1704 alone, John Harris offered a detailed account of the device for popular use, a “Mr. Marshall” began selling a version of the camera obscura in his shop on Ludgate Hill, and Newton’s Opticks demonstrated its employment in optical experiments. And it was well-known that they were useful in taking the design of anything. 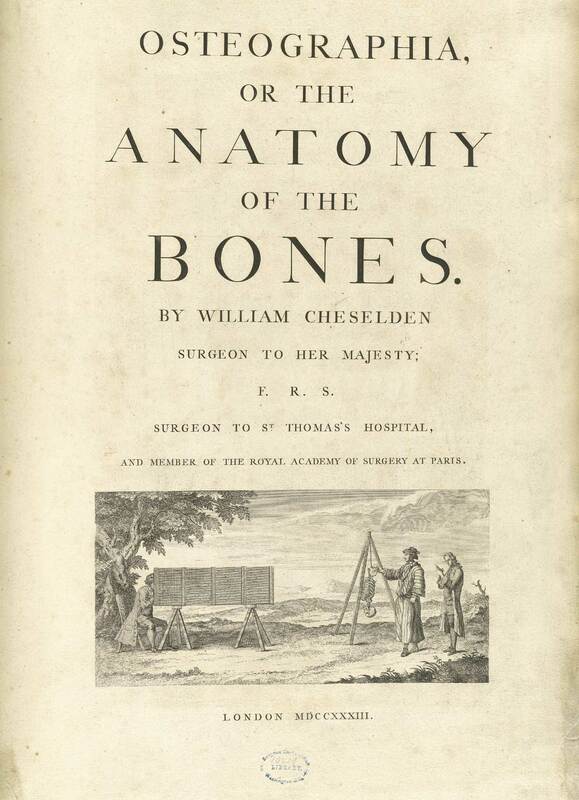 Surgeon William Cheselden seems to have had one used to render the bones of the human body in his manual on osteography. Reynolds seems to have tinkered with his own, though whether he used it in the painting of portraits is unknown. What is certain is that the camera obscura served as a model for a new understanding of the eye; the eye could be imagined as a chamber with a sensitive receptive surface. At the same time, it offered a design for the mind as the detached observer of sensory experience. As such, it turned up in a wide range of philosophical treatises, not least of which was Joshua Reynolds's Discourses on Art, his series of lectures to the Royal Academy, which assumes that the mind is a sort of gallery of pictures, of the sort that might be gathered by a camera obscura. The Royal Academy, which he helped found, was meant to be an epitome of the world of visual art gathered in one place, for the more efficient training of the minds of young artists. Notes: Numerous histories and technical descriptions of camera obscuras exist. One such recent study is Wolfgang Lefèvre and Norma Wenczel’s “The Optical Camera Obscura,” I and II, in Lefèvre, ed., Inside the Camera Obscura—Optics and Art under the Spell of the Projected Image (Berlin: Max Planck, 2007), 5-30; J. Waterhouse, “Notes on the Early History of the Camera Obscura,” The Photographic Journal 25 (1901): 270-91. For a couple of contemporary accounts, see John Harris, “Camera Obscura” in Lexicon Technicum (London: 1704); Sir Isaac Newton, Opticks (1704; rpt 1730), 26. Among the most important essays on the historical importance of the camera obscura for models of mentation are Svetlana Alpers's Art of Description and Jonathan Crary's Techniques of the Observer. Also of interest: Lee W. Bailey's "The Skull and the Darkroom," in Philosophy of Technology (Dordrecht, 1989); and Nicholas Wade and Stanley Finger, "the Eye as Optical Instrument," Perspective 30 (2001).